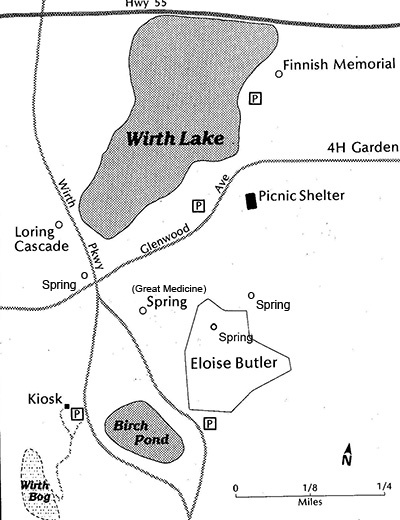 This document is a series of first-hand accounts concerning the activity of four natural springs in the area of the Eloise Butler Wildflower Garden and Bird Sanctuary in Theodore Wirth Park, Minneapolis, covering the time period 1934 to 1990. For more details on one of those four - the Great Medicine Spring, and the rejuvenation work carried out on it by the Friends of the Wild Flower Garden, see this document - Great Medicine Spring. The one Mr. Futcher calls ‘on the northwestern corner of Glenwood and Wirth Parkway’ is the one Avery calls ‘kitty-corner to the present spring’ and what Mr. Futcher calls the one ‘east of the back gate’ is the one Avery calls ‘just outside the Garden toward the picnic ground’. Mr. Futcher’s directions are exact as to where those other two springs are. The only one Mr. Futcher does not mention is the one inside the Garden that Martha Crone had work done on in 1939 and where Ken Avery states (above) “there was also the tiniest trickle of water . . . Thus, Mr. Futcher’s ‘main one’ is Mr. Avery’s ‘present spring’ - in other words - The Great Medicine Spring. Part of what makes his location description confusing is “located in the bog just behind the Garden”. There is a boggy area on three sides of the location of the spring, but the spring itself is on raised ground. 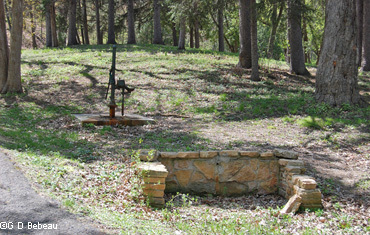 Below: The catch basin and pump of the Great Medicine Spring, not functional, as seen in 2008. It is unclear when the existing rectangular stone catch basin was put in, but it is just downhill from the pump on the spring and predates the work done by the Friends in 1999/2000. The pump was removed and the well capped in 2018. Photo G D Bebeau. The spring obviously ran periodically and sporadically in the years after 1979 as that is when Steve and Sally Pundt remember getting spring water along with others. [see article on the Great Medicine Spring] But at a meeting of the Friends board of directions on April 15, 1989, Gardener Cary George stated that the spring outside the Garden had dried up. While it may or may not have run again, the lack of water and poor quality of what water there was, led to the suggestion that The Friends should undertake the project of rejuvenating the spring. It is also obvious from Ken Avery’s notes that the water table was lowering long before the I-394 construction occurred. While the dewatering for the freeway construction cannot be said to cause the drying up of the springs in the area, it is probably contributing to water levels not rising again. For current history updates and photos on this spring see the article Great Medicine Spring. Each day hundreds of people drive by the intersection of Wirth Parkway and Glenwood Ave., perhaps on their way to or from the Wildflower Garden just around the corner on Wirth Parkway. Most probably never pay any attention to this ragged group of shrubbery on the NW corner of the intersection, but therein lies one of the four natural springs in the immediate area of the Wildflower Garden. In the text above on this page the location of this spring is identified by both former Eloise Butler gardener Ken Avery and by Friends member J.S. Futcher. Mr. Avery states that in 1951 the spring was still running. It was one of three running springs in the immediate vicinity of the Eloise Butler Wildflower Garden, plus the spring in the Garden, but that by 1954 it had dried up. 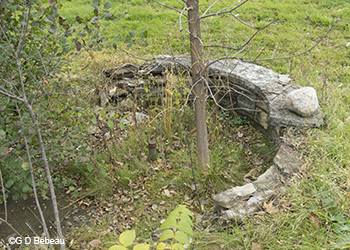 There remains today a capped metal pipe sticking out of the ground and the crumbling semi-circle of stonework. 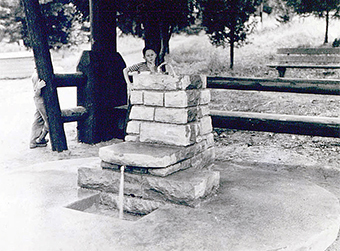 In 1939 a WPA masonry crew installed that stone work and a catch basin. They came back in 1941 and installed concrete steps leading from the Parkway down to the spring. Today, nature has taken over, the staircase is gone, but the traces of history are there. As seen today: The catch basin of the old spring at the corner of Glenwood Ave and Theodore Wirth Parkway with old capped pipe showing. Photo - 2016, G D Bebeau. 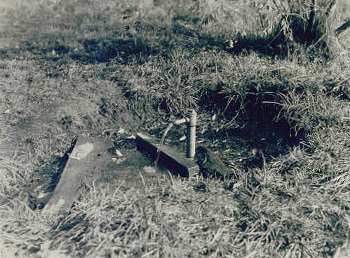 The old catch basin of the spring just prior to 1939 WPA concrete work. Photo by Walter B. Dahlberg. 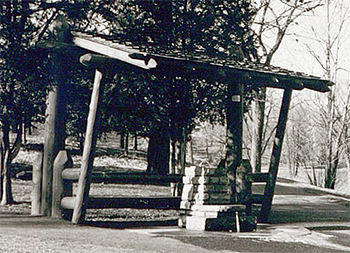 New stonework just completed by the WPA crew in 1939 at the corner of Glenwood and what is now Wirth Parkway. Photo by Walter B. Dahlberg. Click on image for larger version. 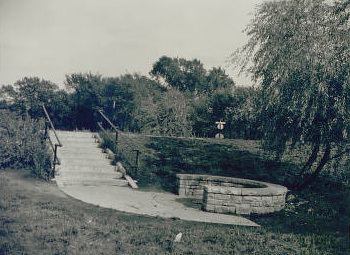 In 1941 a WPA masonry crew added these concrete steps leading off Glenwood Parkway down to the spring basin. 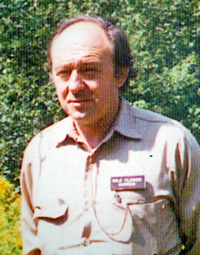 Photo by Walter B. Dalhberg. Martha Crone’s notes on the Spring in the Garden. 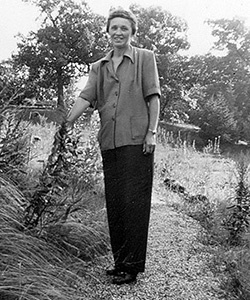 Martha Crone in the Upland Garden in June 1951, from an article in the Minneapolis Tribune. Martha Crone was Curator of the Eloise Butler Wildflower Garden from 1933 through 1958, succeeding Eloise Butler. During that time an open area of water existed in the wetland area of the Garden. Excess water in the wetland from rainwater and from the general level of ground water drained northward out of the wetland. Spring water was also known to exist. A small pool had been created at the north end of this wetland by a dam Eloise Butler installed in the first years of the Garden's existence. It was an earthen dam at first, replaced by a concrete dam in 1917 and then a rock dam in 1992. Overflow from the dam drained into the meadow north of the Garden's current back fence, where in 1932 Eloise Butler created her Mallard Pool (PDF). On August 22 a group of men came in and began looking for a spring near the pool. While they were there they closed up a hole in the office dug by a woodchuck. On the 28th the men struck the spring on the west side of the pool, they secured the area from their work making it un-noticeable. The spring had a large flow and within 24 hours had noticeably put water in the pool. By the 31st, the pool was running over so on Sept. 2nd the men came back and put in a drain pipe so the pool would drain excess water through a pipe. 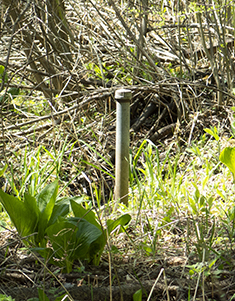 This pipe in the wetland appears to be a cap for the spring that was tapped in 1939. It's not clear from her notes as to where this pipe went or why it was necessary as all excess water drained northward where it could flow over the dam and out of the Garden. The drain pipe may have been necessary to prevent washout of the northward flowing water channel that drained the wetland. The pipe would have led to the dam area where the excess water could then drain. 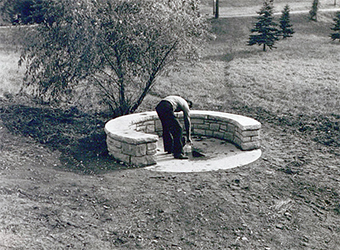 The catch basin of the old spring just outside and east of the Garden's back gate, 1939 construction. The run-off channel is seen in the upper right of the photo - water there flows northwestward to join with the outflow from the Garden and then into to area of Eloise Butler's Mallard Pool. Photo - 2015 G D Bebeau. 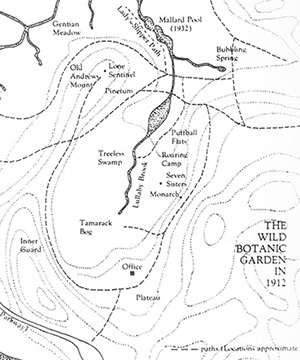 A plan Map of the early Wildflower Garden with Eloise Butler's place names. Note the "bubbling spring." Map courtesy Martha Hellander. The 1939 semi-circular stonework around the spring on Glenwood and the one outside the back gate of the Garden are identical whereas the 1939 stonework of the Great Medicine Spring was removed when the fountain was dismantled. This spring contributes to the history of Eloise Butler's Mallard Pool, which lay in what is now a wild area north of the Garden's back gate. Eloise stated she placed her pool just below where two streams combine in the north meadow. One of those streams is the runoff from the Wildflower Garden and the other moves water from the east, incorporating any runoff for the spring, and then joins the Garden runoff stream and the combination flow north toward Wirth Lake. In the Text above, Mr. Futcher states that the spring was running when he was a kid (i.e. 1940s). Although in 1934 Martha Crone noted in log on July 2 that the 'drinking spring' had dried up. Based on the text below, we believe this is the spring she was referring to. Thus, the events of later years were already foreshadowed in the 1930s. 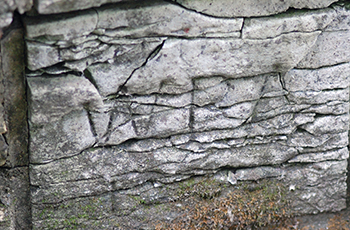 Above: WPA inscription on the inside of the catch basin. Photo ©G D Bebeau. In 1942 a full page display on the Wildflower Garden was printed in the Minneapolis Sunday Tribune on May 24 and one of the featured vignettes about the Garden was how you could enjoy a cool drink of Spring Water. 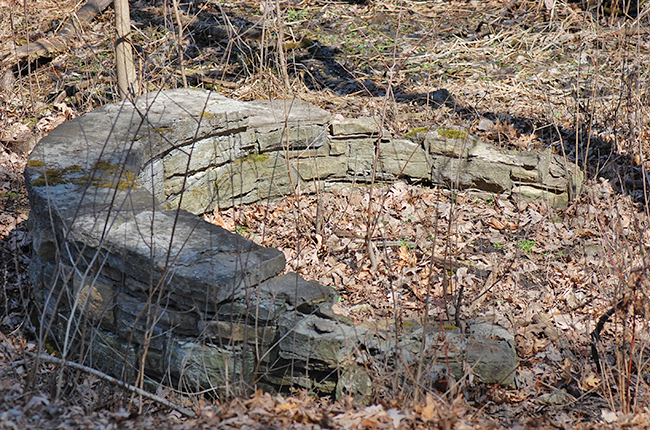 The article stated “One of the few civilized touches in the park is this stone setting for one of the four springs.” At that time the area around the spring was still considered part of the Wildflower Garden, but the spring was not enclosed with a fence. Ken Avery referred to it (text above) "where, I’m told, people used to have parties on spring water and gin". Martha Hellander's research about the Wildflower Garden indicated that in those early years it had picked up the name "Bubbling Spring"
Text, and research by G D Bebeau. Photos as credited. The issues of the the Friends newsletter, The Fringed Gentian™ that are referenced in the text are the volume and issue numbers as they are archived on the Friend website archive of past issues, which corrects out of sequence chronological numbers that happened on numerous occasions between volumes 20 and 50.